Finally, the very first version of user manual is available online now under the following link. At the eResearch Australasia 2013 conference we carried out half a day workshop on Image Analysis and Processing in the Clouds using Scalable eResearch Workflow-Based System. 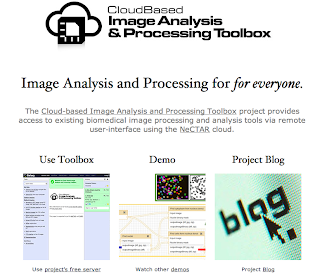 The Cloud-based Image Analysis and Processing Toolbox project provides access to existing biomedical image processing and analysis tools via remote user‐interface using the NeCTAR cloud. If you are interested to use our tools, please contact us. Meet us at the International Conference on the Use of Computers in Radiation Therapy (ICCR2013) which is held in Melbourne Convention and Exhibition Centre (6-9 May 2013). The conference has many interesting themes, including: dose calculation methods, analysis/evaluation of 3D distributions, Monte Carlo modelling, verification imaging including CBCT, segmentation, data mining, image registration, imaging for planning including functional, etc. We display our poster entitled Cloud-Based Workflows Tools Supporting Medical Imaging in the Segmentation section, and here is the link. We are currently in the phase of accepting new pilot users. If you are interested please send us e-mail. X-TRACT - a software for advanced X-ray image analysis and Computed Tomography currently in use on the MASSIVE cluster at the Australian Synchrotron, ANU and at the Shanghai Synchrotron in China. X-TRACT implements a large number of conventional and advanced algorithms for 2D and 3D X-ray image reconstruction and simulation. X-ray projection data must first be converted into sinograms before CTreconstruction can be carried out. Each sinogram contains data from a single row of detector pixels for each illuminating angles. This data is sufficient for the reconstruction of a single axial slice (at least, in parallel-beam geometry). Ring artefacts are caused by imperfect detector pixel elements as well as by defects or impurities in the scintillator crystals. Ring artefacts can be reduced by applying various image processing techniques on sinograms or reconstructed images. Dark current subtraction compensates for the readout noise, ADC oﬀset, and dark current in the detector. The dark current images are collected before and/or after CT measurements with no radiation applied and with the same integration time as the one used during the measurements. The dark current image is subtracted from each CT projection. Flat-ﬁeld images are obtained under the same conditions as the actual CT projections, but without the sample in the beam. They allow one to correct the CT projections for the unevenness of the X-ray illumination. The function is used for correction of transverse drift between related experimental images. Image drift is assessed by cross-correlating pairs of images. The TIE algorithm allows the recovery of the optical phase of an electromagnetic wave (e.g. an X-ray beam) from a single near-field in-line image by solving the Transport of Intensity equation under the assumption that the phase shift and absorption distributions are proportional to each other. This method is usually applied in propagation-based in-line CT imaging (PCI-CT). Filtered back-projection (FBP) parallel-beam CT reconstruction. High speed CT reconstruction algorithm. Automated calculation of the centre of sample rotation in a CT scan from experimental X-ray projections, sinograms or reconstructed axial slices. The choice of available CT reconstruction filters will include at least the Liner-Ramp, Shepp-Logan, Cosine, Hamming and Hann filters. This option enables the user to select a subset of axial slices to be reconstructed and/or limit the reconstruction area to a user-defined rectangular subarea of the axial slice. The option reduces the reconstruction time and the size of the output data. Enjoy using the toolbox and look forward to its release in the near future!